well, it's official. my sewing summit nerves have resulted in some serious sewing mojo. it seems the only way i can distract myself from a pile of nerves/excitement is sitting behind my machine. but hey, i'm not complaining! so what's on deck for the rest of the weekend? 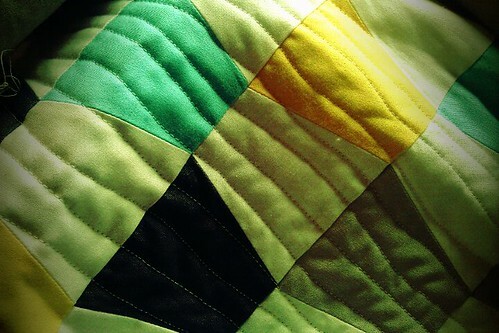 -a quilty photo shoot for this tumbler quilt. -still need to take pictures of my finished weekender bag, too! -pre-sewing summit meet-up!! :) the bf and i will be heading a few hours south this weekend for a lunch date with deedrie of mybricole, jeni of in color order, and vanessa of v & co. can't.wait. so, what are you all up to this weekend?? family wedding, no sewing going on here until Monday...then it's a race to the finish! Megan, do you use your walking foot when you do that organic quilting? Any tips? I want to try, but s.c.a.r.y. The weekend? Son home from the midwest for a few days - yeah! Lots of family time. Love the tumbler. And the style of the photo, not sure what you did with photo editing but I love it. This weekend - watching my older son play soccer, finishing hand-stitching the binding on my summer sampler quilt/wall hanging, and relaxing with the family!